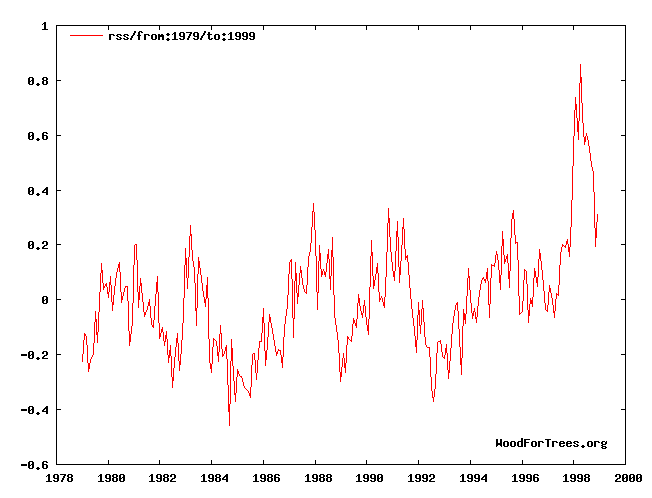 Tom Nelson: 1998: Hockey stick hype coincided with real-life temperature spike. Scientists and public fooled by natural variation? 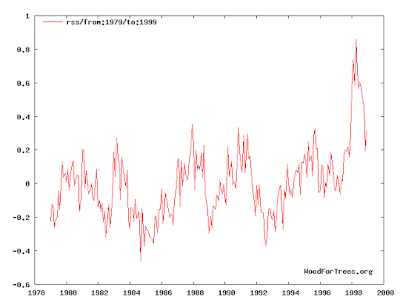 1998: Hockey stick hype coincided with real-life temperature spike. Scientists and public fooled by natural variation? Below is some background information on late 1990s hockey stick hype, the simultaneous elevation of newly-minted Ph.D. Michael Mann to IPCC lead author, the conversion of "many scientists" to believers, and the real-life temperature 1998 temperature spike. My hypothesis is that the natural 1998 temperature spike was crucial in selling both scientists and the public on the validity of Mann's bogus hockey stick. If the exact same paper had been published after, say, an 18+ year hiatus, not nearly as many people would have been fooled. Many scientists who had until then remained sceptical of climate change were convinced and the headlines and broadcasts meant that large swathes of the public were simultaneously concerned about the activities of the oil companies, the profligate use of coal and oil in developed countries, and the amount of carbon dioxide pouring into the atmosphere. IPCC TAR and the hockey stick | Climate Etc. JC comments: Christy’s assessment, when combined with the UEA emails, provides substantial insight into how this hockey stick travesty occurred. My main unanswered question is: How did Michael Mann become a Lead Author on the TAR? He received his Ph.D. in 1998, and presumably he was nominated or selected before the ink was dry on his Ph.D. It is my suspicion that the U.S. did not nominate Mann (why would they nominate someone for this chapter without a Ph.D.?) Here is the only thing I can find on the U.S. nomination process [link]. Instead, I suspect that the IPCC Bureau selected Mann; it seems that someone (John Houghton?) was enamored of the hockey stick and wanted to see it featured prominently in the TAR. The actual selection of Lead Authors by the IPCC Bureau is indeed a mysterious process. 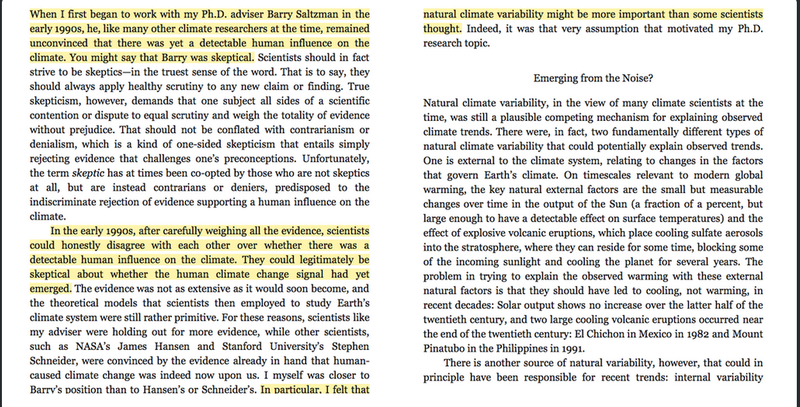 Note in Mann's book "The Hockey Stick and the Climate Wars", page 26, Mann suggests that skepticism was just fine in the early 1990s--you might say his advisor Barry Saltzman was skeptical, and Mann's "was closer to Barry's position than Hansen's or Schneider's. Note the 1998 temperature spike. If you remember, Jim Hansen's sweat fest in congress in 88 [he shut the windows crafty git]. Super El Nino 98 played loud in accord with the alarmists clarion and the public were also duped - people could remember the cold post Pinatubo and the propaganda blitz was a crescendo post Kyoto. We were fooled, we won't get fooled again......and some of us were never fooled in the first place. Inevitably, the earth is a fiercely chaotic and dynamic system and natural cycles and equilibrium is the only way it works and not much if any: is predicated on man made CO2. There can be no runaway warming but it is guaranteed, that, we - the planet will return to an ice age in the imminent future - period! There is plenty of evidence that a great many aspects of climate are cyclical, and lots of reasons to think the "global average temperature" was ready to go up again in the last couple of decades of the 20th century. I have come to believe that much, if not most, of the thinking about CO2 and temperature among the climate scientists is to be chalked up to affirming the consequent. That is, (a) CO2 raises temperature; (b) temperature is going up! (c) therefore, CO2 is raising temperature!